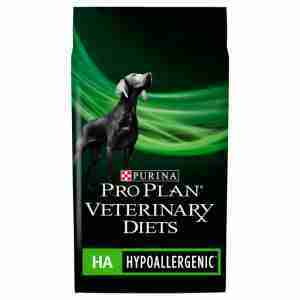 Purina Proplan Veterinary Diets Canine HA Hypoallergenic is carefully formulated to help you diagnose and manage most food allergies your dog could be suffering from. Proteins and carbohydrates, like chicken and wheat, can sometimes cause allergies in your dog. This food is hypoallergenic and hydrolysed, which means the proteins and carbohydrate sources have been broken down and purified to prevent allergic reactions. This allows you to use it as a base for an elimination diet to find out which food group your dog has an intolerance to. Fatty acids are also included in the form of omega-3 and omega-6, which boost your dog’s natural allergy defence. Natural ingredients including fish oil, soya protein, and coconut oil provide all the nutrition your dog needs while reducing the risk of a reaction. formulated to be suitable for both adult dogs and puppies. Food allergies could affect your dog regardless of size or breed, although they usually develop in dogs under three years old. An allergy happens when your dog’s immune system over-reacts to something in their diet. The most common cause tends to be proteins such as dairy, beef, chicken, and corn. These same proteins are also very common in normal dog foods. Symptoms of an allergic reaction can include itchy skin around the face, ears, feet, and forelegs, and general skin infections. A food allergy can be hard to pinpoint however, and your vet could recommend a dietary trial, or ‘elimination diet’. Using a food like Purina ProPlan Veterinary Diets Canine HA Hypoallergenic won’t provoke any allergic responses, so is often a good place to start. That said, this food is also a great choice if your dog suffers from digestive problems, as the formula is very sensitive on your dog’s stomach. Because veterinary diets are formulated for the nutritional support of pets with specific clinical conditions, we recommend that you only use them under professional advice. For more information on feeding Purina ProPlan Veterinary Diets Canine HA Hypoallergenic to your dog, please consult your veterinary surgeon. Maize Starch*, Hydrolysed Soya Protein**, Minerals, Coconut Oil, Sugar*, Rapeseed Oil, Soya Oil, Fish Oil, *Purified Carbohydrate Sources, **Protein Source. Protein: 21.0%, Fat content: 10.0%, Crude ash: 5.5%, Crude fibres: 2.0%, Carbohydrates: 54.0%, Omega 3 fatty acids: 0.5%, Omega 6 fatty acids: 1.8%, EPA and DHA: 0.15%, Medium chain fatty acids: 1.3%, Additives: Nutritional Additives IU/kg: Vit A: 30 000, Vit D3: 1000, Vit E: 350, mg/kg: Ferrous sulphate monohydrate: 245, Calcium iodate anhydrous: 3.2, Cupric sulphate pentahydrate: 50, Manganous sulphate monohydrate: 100, Zinc sulphate monohydrate: 420, Sodium selenite: 0.29. This feeding program is recommended as a guideline only, with optional adjustments for proper weight maintenance. Purina HA was suggested by our vet due to ongoing bowel problems with my Golden Retrievers, one loves it the other one seemed to have difficulty eating it and was having to be hand fed piece by piece as he would not go near the dish, after a couple of days we tried soaking it with hot water, did the trick now he loves mealtimes again and the food. After being on the food for less than a week it seems to be working for both of them, fingers crossed it carries on. This is an excellent food for my dog Jess. She really likes it and she is now nearly 11 years old and gets skin allergies now and again. purina was suggested by vet to help my scottie with his allergy problems. He ha s been on it now for 2 months and it has helped him greatly. He likes it and is always ready for mealtime. Great service from pet supermarket as well. Suggested by our vet and not only does it suit our dogs digestive system but he likes it as well. Also brilliant service from Medicanimal as usual.